When I crossed the threshold into my grandparents farm home in Carmel, Maine as a child I was always greeted by warmth. There was warmth in the kitchen where perpetual cooking scented the air with the aroma of home cooked stews, breads, and pies. There was the warmth of nonjudgmental affection. I felt secure in the knowledge that it was a place that focused positive energy and support on a future that mattered to me. It is time for Maine voters to come on home. The tea party sideshows and the politics of selfishness offered by Paul LePage are a cold level of extremism that will not serve Maine citizens well in the short or long run. Moderate Republicans know that his angry confrontational style will sideline appropriate necessary collaboration to serve Maine citizens. His energy is destructive and divisive. We have learned that Eliot Cutler is not all that 'independent' when it comes to hauling in millions from China lobbying work and sitting on the Board of Directors of a company deeply at fault in the recent mortgage meltdown. His 'independent' positions either mirror those of Paul LePage in some instances or are carefully crafted to present him as "not one of the other two". His resume does not offer us the type of skills and experience that we need in Maine. Only a few days remain in this campaign and the din of commercials, up and down polls, flyers, charges, and countercharges will make it harder to hear convincing arguments for why a particular individual is best suited to help our state navigate beyond the national economic storm that was brought on by Wall Street greed and unchecked corporate power. In truth, Maine's economy, state revenues, services, and constructive perceptions about the role of governing have all been victims of a crisis largely outside our borders. Despite repetition distorting reality by the Maine press and her opponents, Libby Mitchell does not hail from the fringes of the Democratic Party. She has been a moderate, pragmatic leader who reflects Maine citizens' concerns about small business, the environment, energy conservation, and education. Libby Mitchell has a long history of service as a town official, a legislator and a community volunteer. She has an established record of collaborative leadership and working thoughtfully across the aisle to seek solutions to challenging Maine issues. And Libby Mitchell has the experience of serving as a leader in positions of authority as Speaker of the House and Senate President who is considerate of broad input, willing to act on a bipartisan basis, and focused on serving all Maine citizens with the very best reasonable and positive outcomes. Maine has been an example of fiscal restraint and bi-partisan government. The current state budget is the same as it was in 2001; there have been no major tax increases over the past nine years. The state budget has received support from Democrats and Republicans. Libby Mitchell has been a leader in this fiscal environment. In our state, we can be proud that we value good governance beyond the influence of corporate and individual wealth through a strong clean elections law. Over 75% of candidates running for the legislature (and almost 70% of Republicans) run with clean election funding. They are joined by only one gubernatorial candidate, Libby Mitchell, in keeping the focus on issues not fund raising and special interests. Letting last minute polling snapshots in this tumultuous election determine one's vote and not voting one's conscience can lead to terrible outcomes. In the end, this is not a game of endorsements, momentum, and polling points leading to a final score representing dollars spent. This is about Maine's future and the issues. It is about each candidate's capability in that future and how each will handle the issues most dear to us. It is time for Maine voters to come on home to good stewardship of our natural environment for people, employment, and pleasure. It is time to come on home to make public education a real priority and not shell parts of it out to private interests. It is time to come on home to develop small entrepreneurial success that leads to good jobs with futures and not bare subsistence jobs that primarily serve out of state shareholders. It is time to cross the threshold into the voting booth and support Libby Mitchell and the issues we share caring about with her. I wonder how Paul LePage would see the world if his childhood family had gotten the intervention services it desperately needed. Does Paul LePage believe that the welfare that he claims he was on was justified or not? And since LePage says he got himself off welfare (* just like 96% of those in Maine) why does he denigrate its temporary use? Or does Paul LePage believe that today a family of 18 within an immigrant community with an abusive parent does not warrant intervention and that a young child should seek his own solutions by his own means on the street and just hope that fortune might take him in? Four percent of TANF cases exceed five years, according to the Department of Health and Human Services. Most of Maine's long-term cases involve disabilities, according to the state. The average time spent on TANF is 21 months, and 85 percent of families leave the program within two years, according to the agency. "50% or better of our families have one parent"
Using a calculator vs. pulling a number out of thin air yields 21.3%. Nitpicking and carping is the countercharge by LePage supporters anytime this stuff comes up. His supporters call him refreshing and say they like it that he is off the cuff, blunt, unpolished, and will "tell it like it is". But he doesn't actually "tell it like it is"; he's perpetually caught using bogus numbers to back up his assertions and claims. We need to confront reality. How will Paul LePage serve us as Governor if he believes only what he wants to believe? Will false assumptions and presumed numbers become the basis for budgets and laws in Maine? Can a liar be trusted with your future, your children's future, and the state's future? The core supporters of Paul LePage have given him a pass on every lie he has uttered. His tea party backers accept lies that fit a world view that gives them the pretext to reshape social policy and slash taxes by heaping derision, based on made up facts, upon everyday workers, the poor, state employees, teachers, and public servants in the state of Maine. Somehow I still want to believe that moderate Republicans, who seek conservative fiscal prudence, will not accept purposeful gross inaccuracy as a basis for setting priorities and making policy. Somehow I want to believe that a vast majority of independents will not accept a leader who seeks scapegoats and freely uses false assertions as Governor. The LePage tea party core not only accepts Paul LePage's lies but promotes, perpetuates, and exaggerates these deceptions. This election is not just about defeating a liar, it is also about defeating a very far fringe right wing movement based on dishonesty. Our vote for Governor in 2010 is our moment of truth. 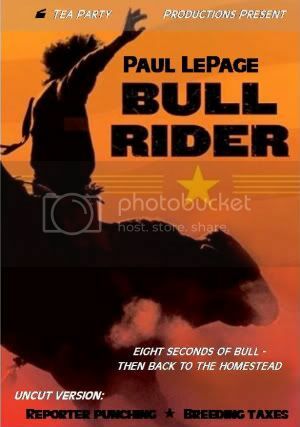 Please consider the number "3" used in the above title merely a posting count of this latest series and no where near the expansive number of deceptions, exaggerations, tall tales, fibs, myth makings, and outright lies by Paul LePage. Taking him to task on the ongoing duplicity that he engages in is extremely important because it gives us an advance look at both the personal character and the character of an administration led by him potentially as Governor. And no matter how one cuts it, Paul LePage being “truth challenged” is a compelling and imperative reason to use in asking fellow citizens not to elect him. He cannot be trusted to tell the truth by unenrolled voters, Republicans, Democrats, or even tea party adherents. Paul LePage is either a pathological or professional liar. Which is unimportant at this time; just protecting Maine from fraudulent leadership is a vital concern of the moment. His personal downfall can simply take its course after an election defeat if he is a deliberate liar or those who care about him can help him seek treatment at that time if he suffers from some delusional disturbance. Most astounding is that for the many claims that Paul LePage makes from buffalo count fantasies to what actually appears as words on a page to his own taped appearances is how completely the actual evidence debunks whatever he says. The counts were not required, printed facts absolutely dispute his claims, and, most glaringly of all, his own recorded words counter his false assertions. Paul LePage has been doing this for a long time and to a degree that it casts a shadow on his alleged on-the-streets upbringing, his educational struggle claims, his time living abroad, his personal ethics, and his hazy professional resume. While he puts himself at the center of many of his wild leaps of his imagination, he is prone to drag in others through smear to boost claims of his being victimized and standing up to his enemies. He did that this summer by asserting that Arden Manning called him unfit to serve as Governor because of his ethnic background. This was simply unfair, untrue, and strategically stupid because of its utter disrespect of the intelligence of Maine voters. All the instances documented in these posts and the numerous ones recorded elsewhere strongly indicate a pattern that says buyer beware. Any review of his video taped remarks generally uncovers some unsubstantiated remark that his most adamant adherents take as fact. This goes back to his tea party courting roots. Like accusing a reporter of dropping the “F bomb” or Arden Manning saying that he is unfit for office because he is Franco American, in this pre-primary video Paul LePage insinuates that Governor Baldacci swore at him. This is a smear of John Baldacci’s character by Paul LePage to further his own personal political ambitions, enlarge his mythical fight against those he opposes on behalf of the tea party, and to elevate his own sense of self-righteous victimhood. Both those who know Governor Baldacci as a decent human being who would not call Paul LePage “some very choice words” and even those who know him as an opponent certainly understand the political instincts of the Governor would be to not foolishly commit such “choice words” to the emails Paul LePage claims he can show us. Paul LePage cannot show us those emails based on the fact that the emails never existed at all. He lied. He lied to perpetuate his myth. He lied to gain false credibility. He lied because he is an impulsive liar. Please consider this my formal Freedom of Access (FOA) request for any emails sent from the office of the Governor or the Governor addressed specifically to Paul LePage as Mayor of Waterville or as an individual as the email's primary recipient during Governor John Baldacci's two terms in office. The purpose of my request is to prove or disprove a claim by Mr. LePage that he can show the public emails from the Governor in which the Governor (or his official representative) called Mr. LePage "some very choice words" because Mr. LePage [allegedly] refused to spend some state provided money and "got under his [the Governor's] skin so bad". Thank you for contacting Governor Baldacci. I am certain he will appreciate hearing from you. I have printed out your message and placed it in the Governor’s in-box. There you have it. The awful language of “thank you”, “appreciate”, “best wishes”, and “sincerely” were used. The emails Paul LePage refers to are completely made up. He wants to give an impression of an inflated prosecution of himself by those he opposes. The problem is that he attacks those he disagrees with lies that go infinitely further beyond stating his opposing views, he places fictional disreputable words in the mouths of his opponents to demonize them and booster his own reputation as a combative hero. Would the dishonesty and lying abruptly discontinue if Paul LePage was elected Governor? Could we trust the state’s new chief executive to tell us the truth? Could we count on him to work honestly on our behalf rather than invent excuses for his failings by blaming others falsely? A single “no” means that a no to Paul LePage is absolutely vital to good, fair, and honest governing in the next four years. Spread the word. Buyer beware. We cannot afford a liar in the Blaine House.